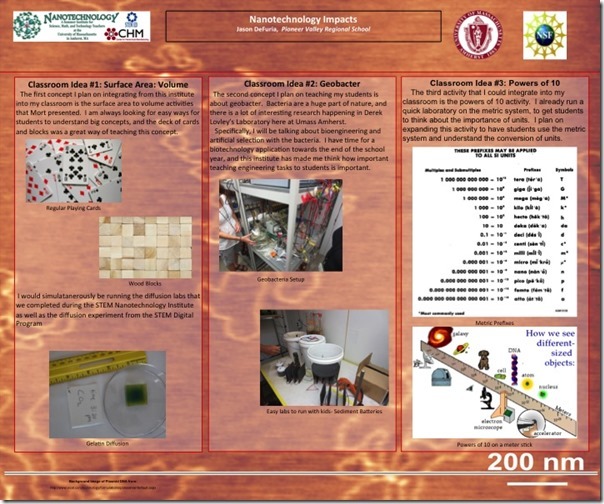 Day 5 was a good conclusion to the excellent experience that I’ve had at the UMass STEM Nanotechnology Institute 2013. 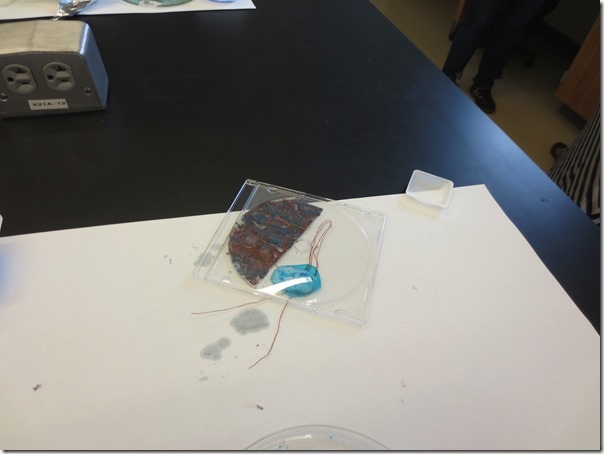 We reviewed our crystal and Gelatin Diffusion experiments with the ADI software that I learned about at STEM Digital. It was powerful to be able to analyze the results with both Microsoft Excel and the ADI Software. Jonathan Rothstein gave a presentation and talked further about Nanomedicines. As I posted yesterday about Nanotechnology impacts, nanomedicine will change the way that we treat many conditions and diseases. Nanomedicine will change the way that we even think about different diseases. We spent the rest of the day sharing how we will use the material that we gained from this experience in our classrooms this upcoming school year. I’ve shared my poster below. Day 4 of the Nanotechnology Institute started with the group learning about solar cells from Professor D. Venkataraman. It was interesting learning exactly how solar cells work, and the different work being conducted on different solar cell materials. It was also great to learn about the current solar cell research that is being conducted at the University of Massachusetts at Amherst. 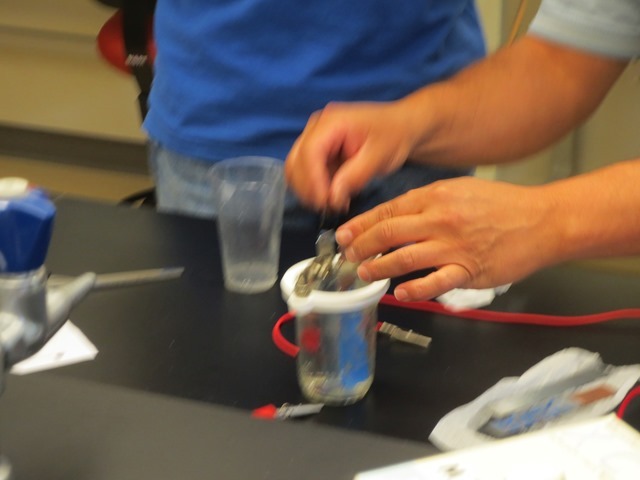 The second item we did was build our own solar cells. This activity was quite fun, and turned into a competition for us teachers, aiming to get the highest output. I can see this activity being very useful in the classroom. We then went through the impacts that nanotechnology can have on society. I am very interested in the nanomedicine category, and show a clip on a cancer drug based on nanotechnology. We also ran some experiments with teflon- on a smooth surface water will bead and stick, on a sanded surface, it will flow off very quickly. 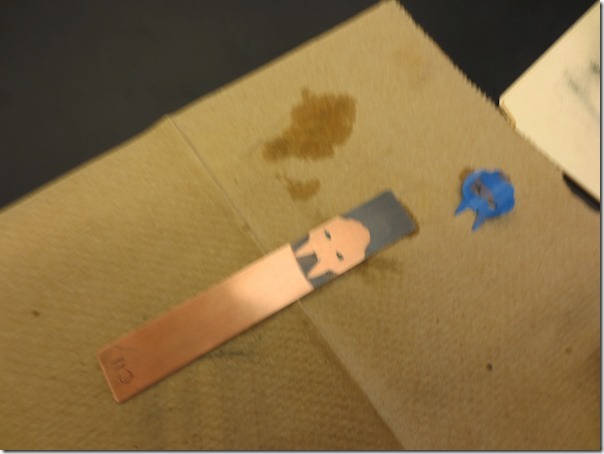 We then completed some labs with lithography and electrodeposition. We were able to use zinc to plate copper. It was interesting, and very applicable to physics and chemistry classes, but I can’t really see a use in my Biology Classroom. We worked on posters for the rest of the day, to be shared tomorrow about our academic plans for the year. We started day 3 of the Nanotechnology Institute by touring labs in Hasbrouck in which research involving nanostrucutres happens. The process of lithography was explained, which I have experience in the Class-100 clean room at the BU Biophotonics Building. 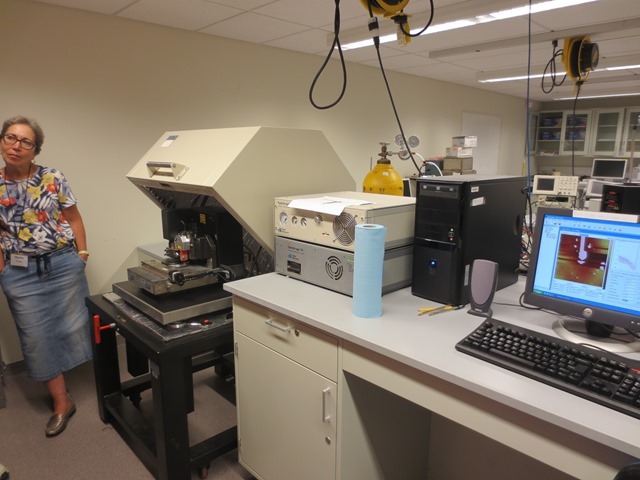 One of the highlights of touring the laboratories was seeing the Atomic Force Microscope in action, imaging a series on nanotubes. 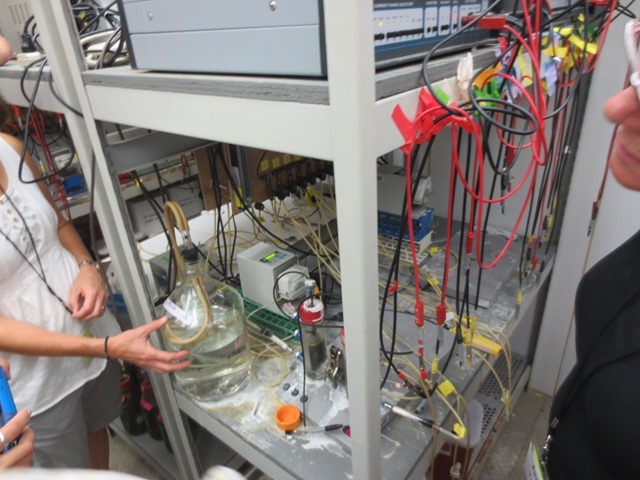 The second tour we went on was in Morrill IV, and dealt with Geobacter in Derek Lovley’s laboratory. 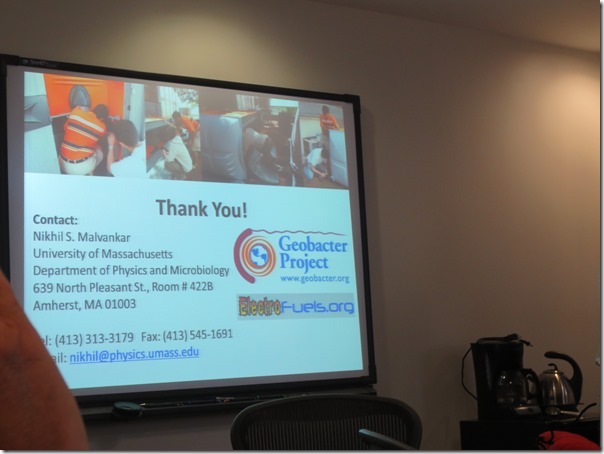 Dr. Nikhil Malvankar presented his research in regards to Geobacter and it’s practical uses in our society. One of the most interesting facets of this research is its potential uses in portable outhouses. It could potentially break down the waste, removing the smell, while creating power that could power a fan, sensors for how full the outhouse is, and light for use during the night. Furthermore, a sensor system could relay this information to the central hub of the waste company. 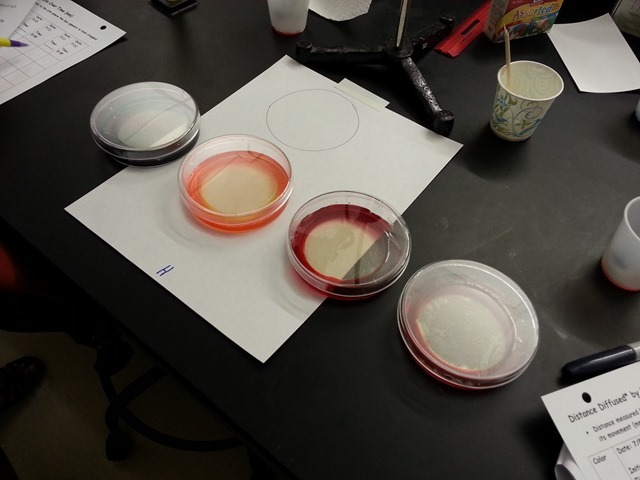 You can study these bacteria in your classroom, using the Keegotech Mudwatt system. We then learned about magnetic memory storage and created a binary coded alphabet exploring secret “coded” messages. This would be potentially useful in a physics classroom or intro computer class. UMass has created a virtual clean room tour, which gives you an idea of what a clean room is like. Clean rooms are important when working on the nanoscale, because even the slightest bit of contamination can ruin your sample. We then explored self assembly of items in a station like system. We went station to station, using wood shapes. There was particularly awesome set up with magnets floating in bottle caps in a small dish. When you put in like magnets, they repelled each other away to form an equidistant design. When you put in different magnets, they self-assembled into a shape. 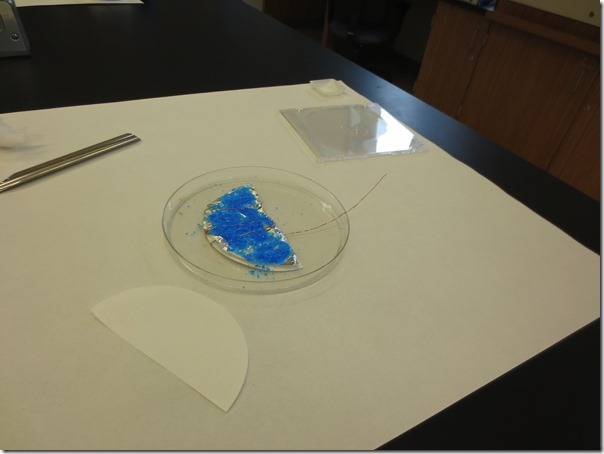 This activity will be a great way to demonstrate bonds in my classroom. Mort Sternheim went on to talk about potential Nanotechnology Careers, and we met in subject groups and talked about what we envisioned our student’s preferences towards STEM careers. The second day of the UMass Nanotechnology Institute started off with Mort Sternheim talking about why size matters. 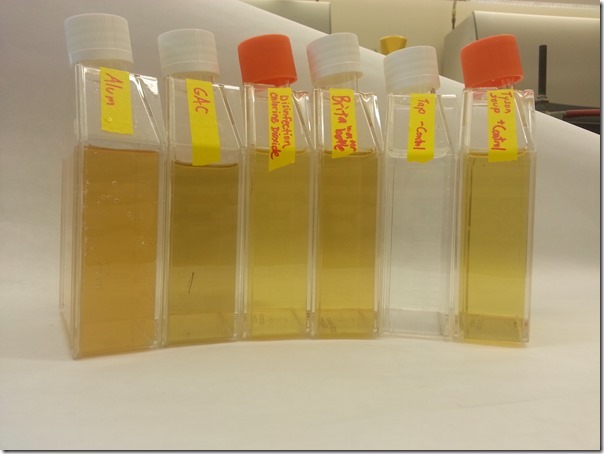 I currently teach the importance of why size matters when it has to deal with cell size. When we are talking about very small items, they have a larger surface area:volume ratio. 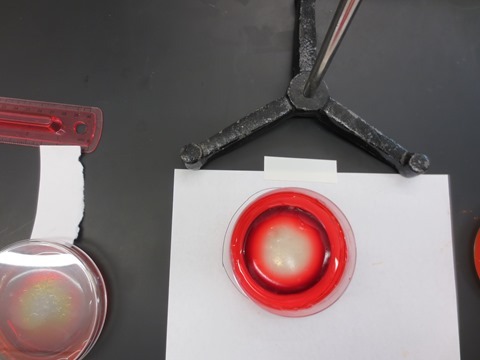 I usually teach this lab using phenopthalein agar and sodium hydroxide. Mort provided 3 other activities (which were cheap and awesome) to teach the concept of surface area:volume , using a deck of cards, wood blocks, and a crushed versus whole alka-seltzer tablet in bromo-thymol blue. The next activity was to about Atomic Force Microscopes. Atomic Force Microscopes use Van der Waals forces to interact with whatever medium you are studying. More about Atomic Force Microscopes can be found in this powerpoint. We then tried to build an atomic force microscope model using common classroom materials. 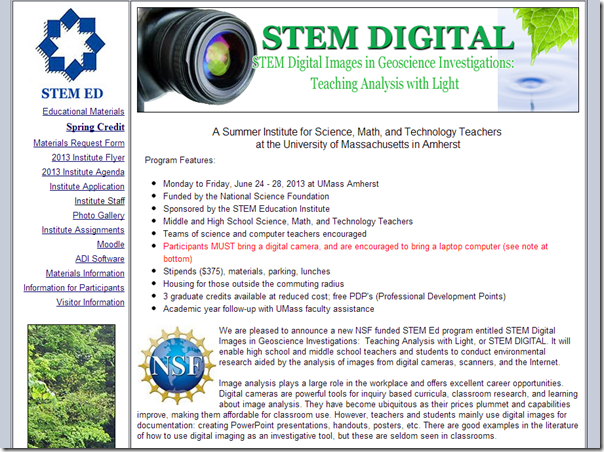 More of the handouts, including teacher’s guides can be found in this repository. The third activity of the day was by (newly tenured) associate professor Dr. Jenny Ross. Dr. Ross talked about her work with microtubules and biology. She talked specifically about how motor proteins interact with microtubules. It was interesting to hear about this current research, unfortunately, it’s not in the public domain (yet), so I cannot post the materials. 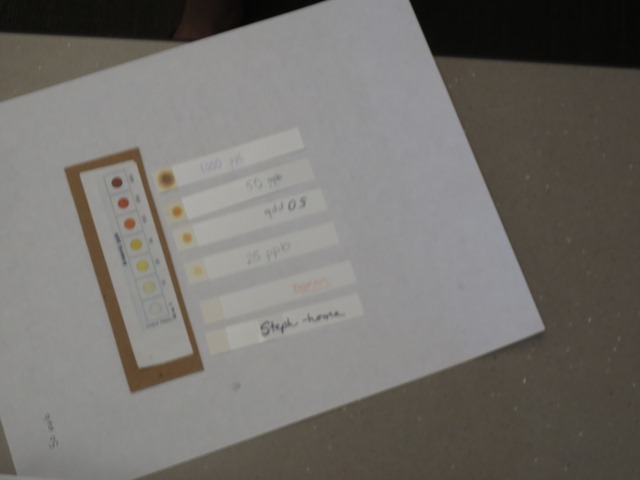 The fourth activity of the day focused on sunscreen and how (mostly) everyone uses too little sunscreen, which is leading to an increased risk of skin cancer.. We ended up completing a series of activities about what types of materials block ultraviolet light. It was interesting to test different materials using UV beads. Finally, we heard from Dr. Mark Tuominen about the iCons program at UMass Amherst. Had this program existed when I was an undergraduate, I would have loved to be a part of this program. The iCons program is a concentration, and focuses on team collaboration- a skill that all scientists today must have. We are no longer in the days of one person being intelligent and solving a problem. We need groups of people to solve problems. I’ll be posting more about this on my personal blog. For more information about the UMass iCons program, check out the website here. 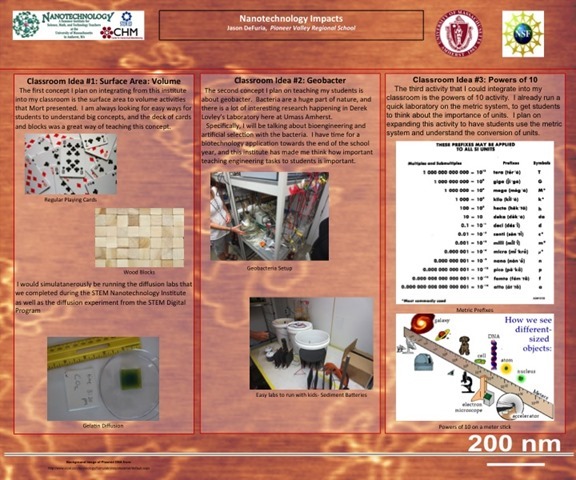 Today started Day 1 of the UMass Nanotechnology Institute 2013, a partnership between UMassK12 and the UMass Center for Hierarchical Manufacturing. This program started off with introductions, and an overview of Nanotechnology by Dr. Mark Tuominen and Dr. Jonathan Rothstein. Part of the powerpoint talked about Lithography, a process that I completed last summer working with BUSat. We then talked about Nanoscale thin films, and used oleic acid to replicate an experiment that Benjamin Franklin completed. It was very interesting to learn that Franklin had realized the oil spreads out to a very thin layer, and our calculations put this layer at around 1 nanometer thick. 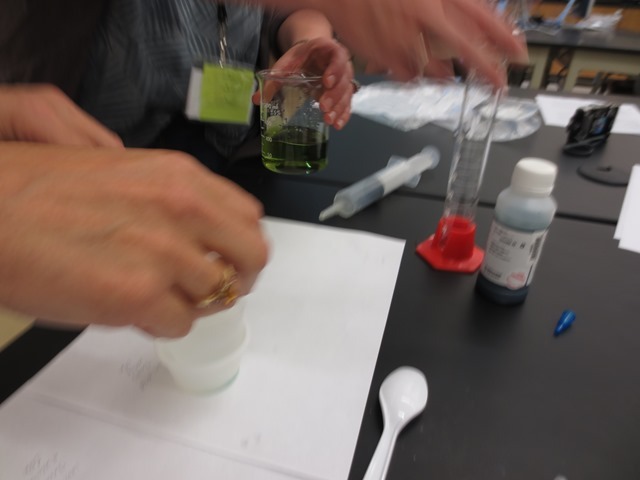 After lunch, we started a gelatin diffusion laboratory, this time using plain gelatin and food coloring. Each day, we will be taking pictures and measuring the amount of diffusion into this gelatin, from the food coloring that is diffusing into the gelatin. 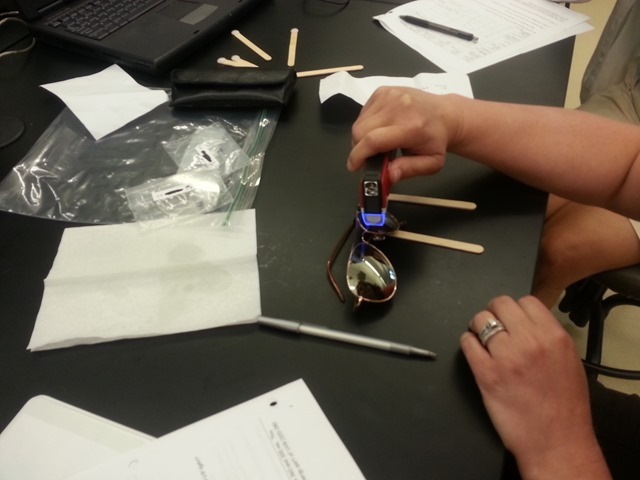 This is a lab that Jennifer Wellborn runs at Amherst Middle School. We then talked about growing crystals. 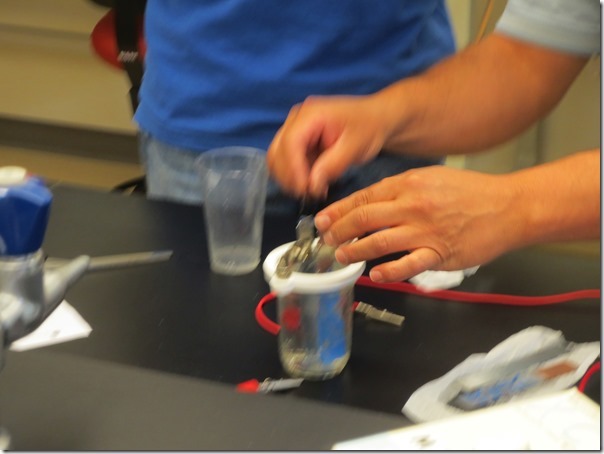 Rob Snyder gave us a supersaturated solution of sodium chloride (NaCl), of which he asked us to make crystals. Specifically, we were asked about self assembly of ionic crystals. We will be measuring these crystals later in the week. We ended the day by talking about powers of 10, and using USB microscopes and other lab utilities to measure different materials. 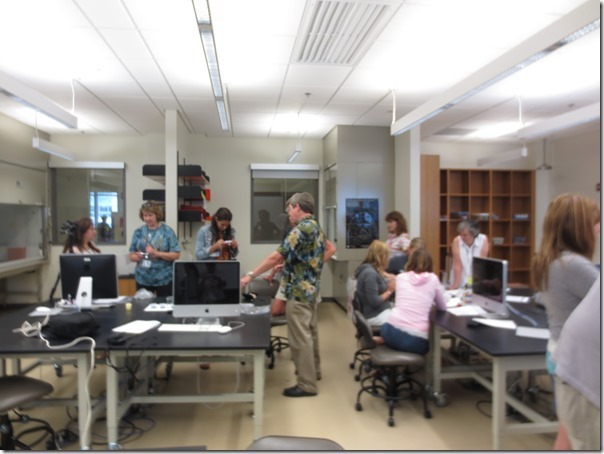 The USB microscopes were awesome, and something that I wish I had access to in my classroom. We then reflected about the day in our subject groups, and talked about what would be useful in our classrooms. As a bonus, we went to the Hanger to eat wings as a group after the day’s activities! STEM Digital, Day 5, started out reviewing water quality and purification processes. Earlier in the week, we had set up leaves for a leaf-leaching experiment. 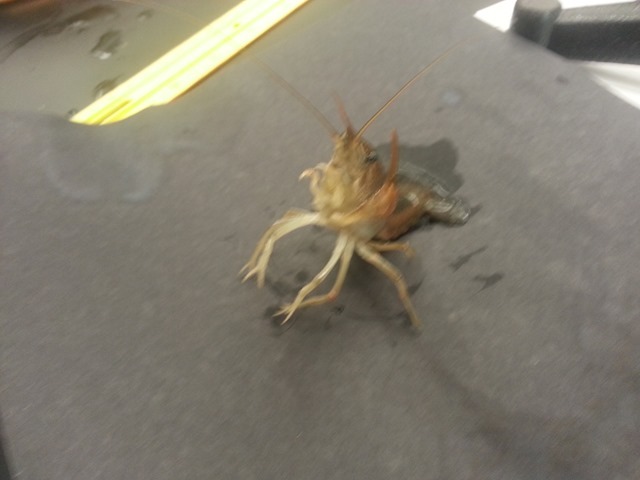 We were now use this water to analyze the matter that had leached into the water. 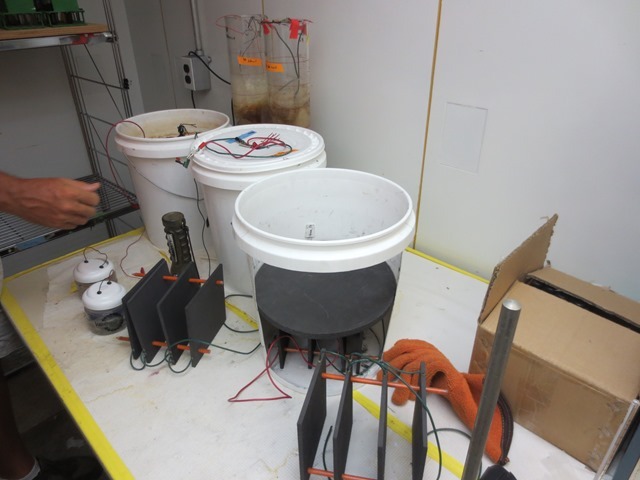 We then tried different purification methods, and rated the efficacy of these methods of treating our water. We then reviewed our earlier experiments, including the Diffusion Experiment and Crayfish Analysis of experiments we started earlier in the week, using the ADI software. Finally, Mort Sternheim gave a presentation on different careers that could be considered that have to do with STEM and digital photo analysis. We met with groups from our subject areas and talked about how our students would be able to use the skills we’re teaching them to find careers. 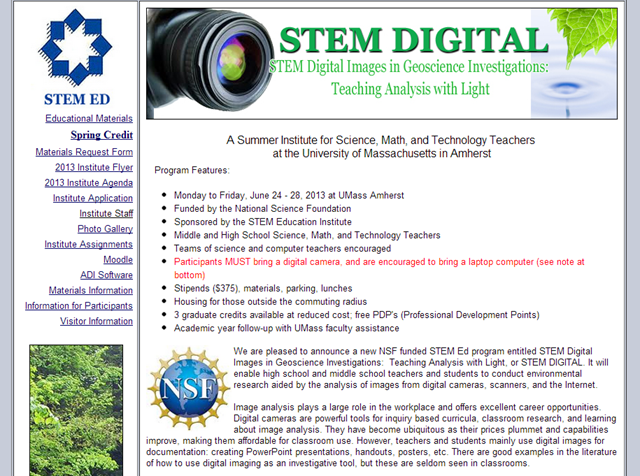 Day 4 of the STEM Digital class at UMass Amherst dealt with Dr. Julian Tyson’s work on Arsenic. Arsenic is of major concern in both rice and drinking water supplies. We talked at length about arsenic contamination in rice due to previous use of arsenic in fertilizers and pesticides. This leads to a lot of arsenic being absorbed in rice now used in these fields. Rice is efficient at taking arsenic from the soil. There are many places where drinking water is contaminated. Arsenic in the United States is limited to a part of 10 ppb, set by the U.S. EPA’s standards on drinking water. 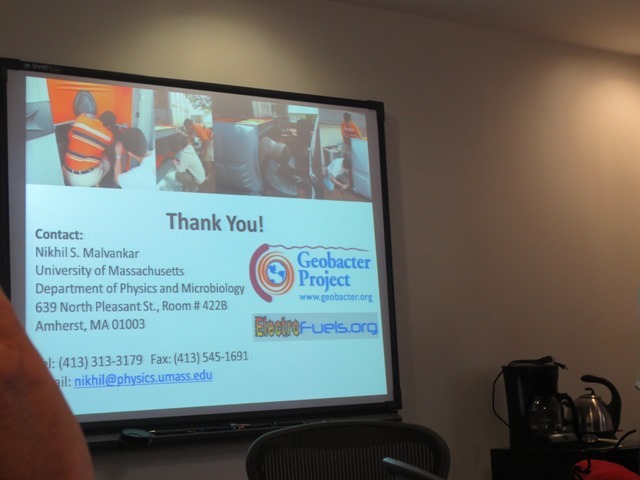 We talked about the importance of checking Arsenic levels in private wells. There are many places, one of which is Bangladesh, where arsenic is killing a lot of people. 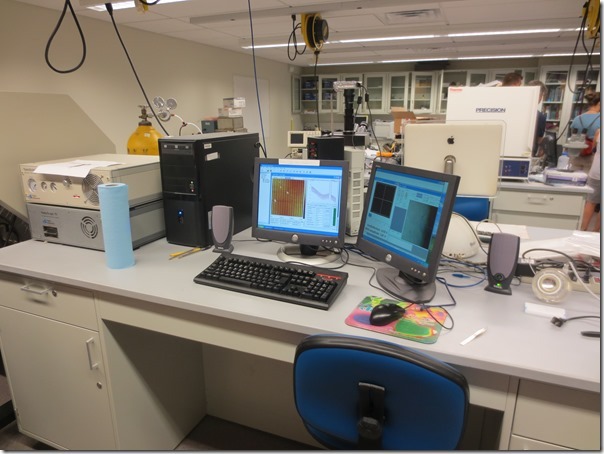 We were also able to tour Dr. Julian Tyson’s lab in Goessmann Laboratory, and see how he conducts analytical chemistry, which was very impressive. I wish I had taken pictures of all of the machines! We started out the day by learning how to use Movie Tracker. Movie Tracker is much like the ADI software. Movie Tracker was really interesting to use, and would be particularly interesting for a physics classroom. 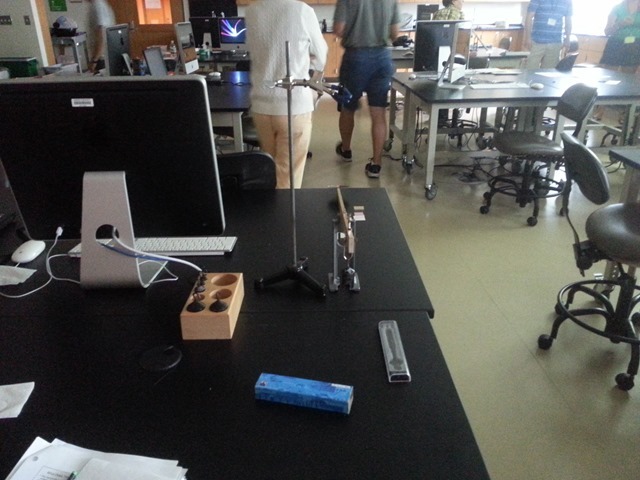 We analyzed different items, including calculating acceleration due to gravity..
After learning movie tracker, we started a series of ozone experiments. 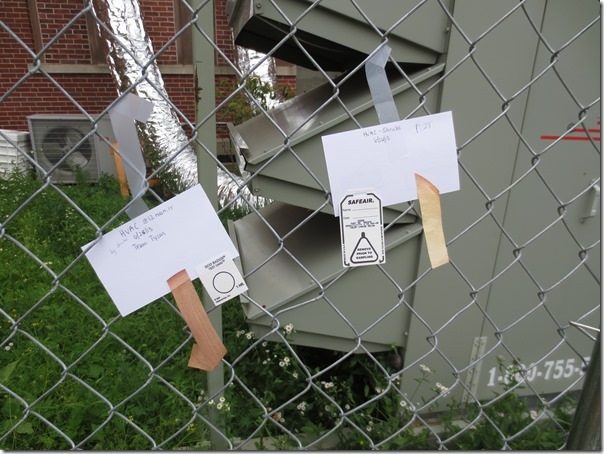 We used homemade (called Shoeinbein Strips) and store bought ozone strips to test the amount of ozone found around locations of our choosing on campus. 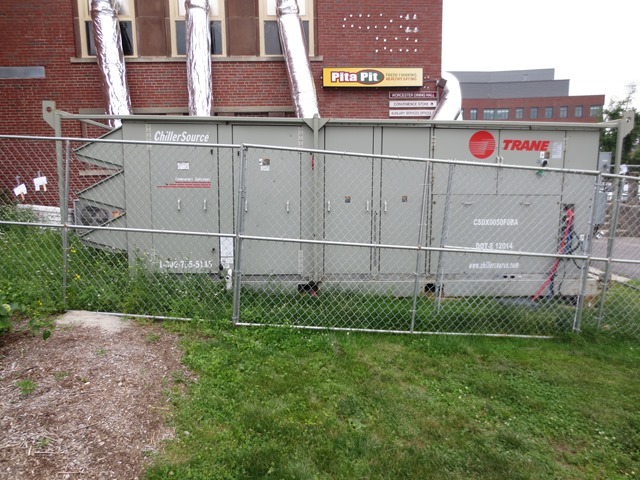 My group decided to test ozone around refrigeration and air conditioning units found near Worcester Dining Common on the UMass Amherst campus, varying time as well (1 hour versus 2 hours). 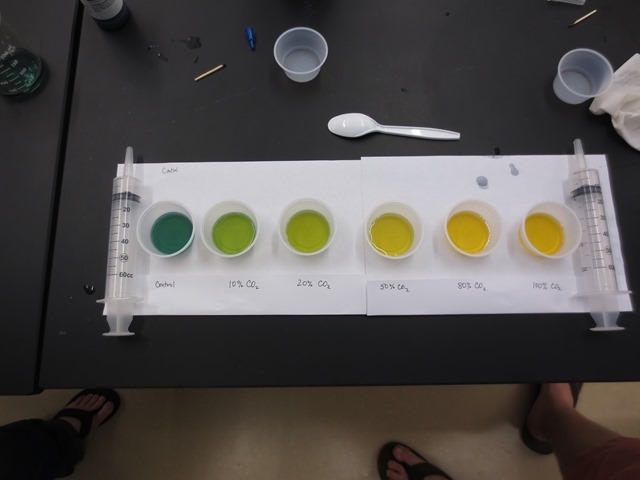 Our results for the ozone experiments supported a claim that there would be no difference between ozone absorbed by shrubs and ozone absorbed by larger trees. 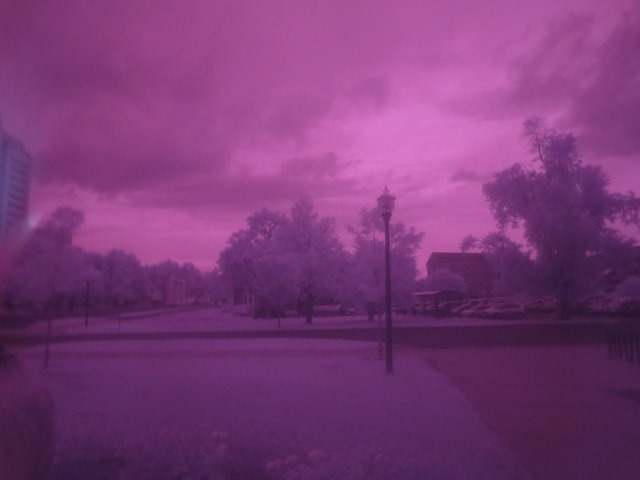 We spent the rest of the day playing in the infrared– using cheap webcams and home-made infrared googles.. Note- do not look at the sun or you will go blind. Our Bromo-thymol blue setup, graded by amount of Carbon Dioxide. Today is the second day of this week long course, and again it started with a variety of breakfast items. We started right at 9 am, analyzing color, which was a great review of the biology of the eye and how it relates to digital cameras. Jennifer Wellborn presented her Skin Color lab, a unit that she collaborated with her grade level team to teach the kids some of the social constructs, which I thought was impressive. The students would use the ADI software to analyze their skin color, and come to the realization that no two people are the same. Debbie Carlisle and Steve Schneider then presented about air quality, specifically in regards to Carbon Dioxide. 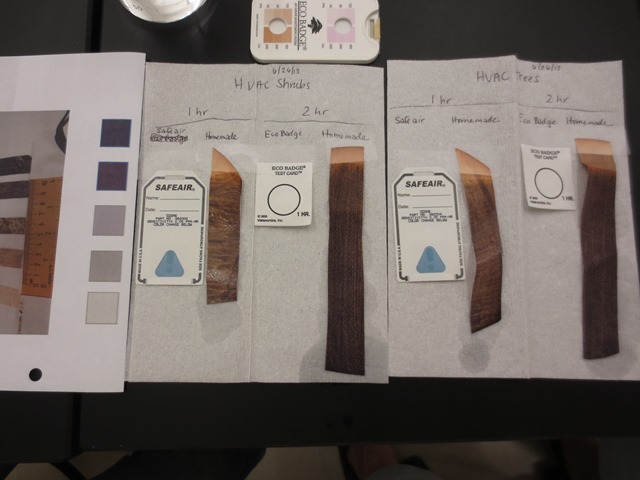 We went to the lab and use Bromo-thymol blue (which I’ve used in class) as an indicator, and made a series of tests to create partial color changes. Bromo-thymol blue turns to a yellow color when exposed to an acidic environment. Aqueous Bromo-thymol Blue will bind with Carbon Dioxide to create carbonic acid. 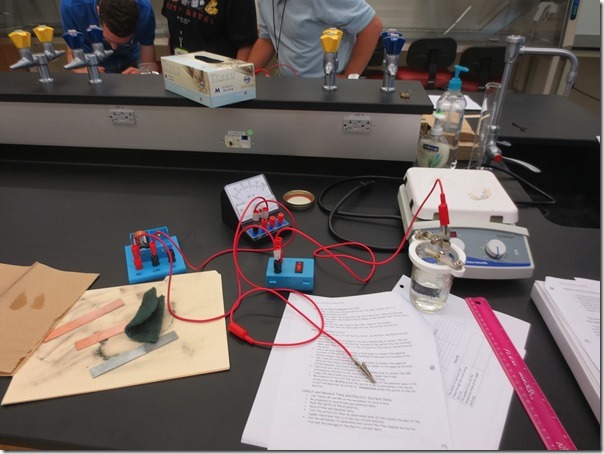 The lab was a really interesting spin on activities that I already do in my classroom, and could link with the Carbon Cycle. 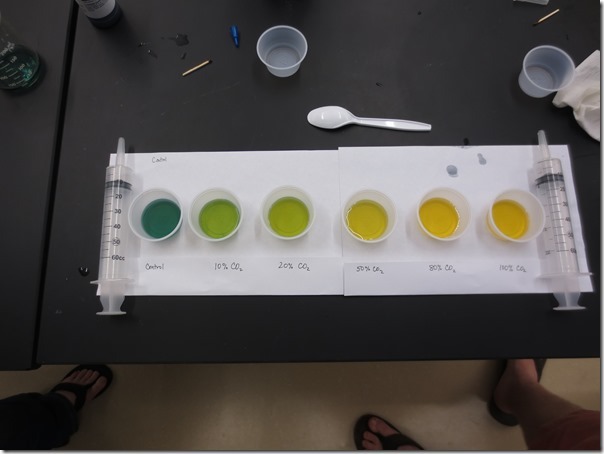 We were easily able to analyze the color intensity of the solutions that we created. 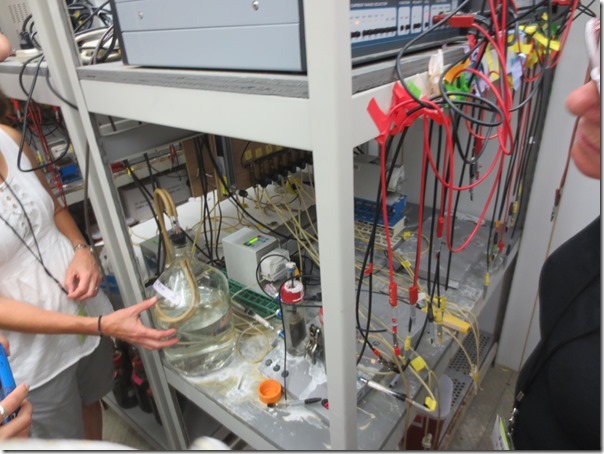 Our lab space for the Carbon Dioxide experiments. Finally, Steve Schneider talked at length about Digital Camera Basics, explaining how different aspects of how digital cameras work, from sensors (CCD vs CMOS), Focal Length, ISO settings, and White balance, amongst other digital camera uses.